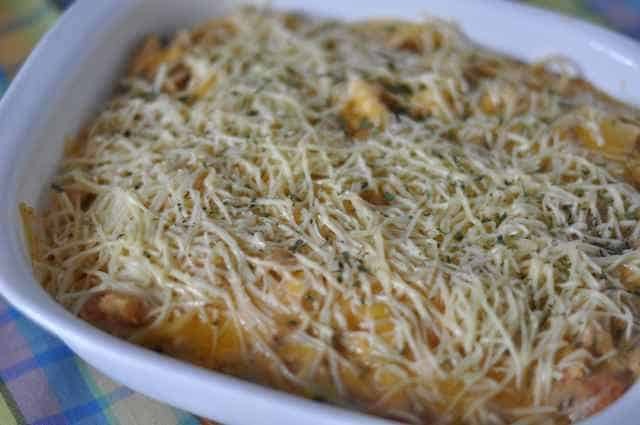 What makes this Chicken Spaghetti bake better? Bacon, bacon makes this chicken spaghetti better. This recipe is a great way to use up left over chicken, or if you don’t have any on hand, boil up a couple pieces of chicken, and you will be making this dish in no time. The Parmesan cheese is a nice change on top of Chicken Spaghetti. A Chicken Spaghetti Bake is a classic Southern dish you will love. Creamy spaghetti is mixed with chicken. Break the spaghetti in half. Cook according to the package directions; drain. In a large saucepan cook bacon, onion, and garlic till bacon is crisp. Blend in flour. Add undrained tomatoes, soup, and milk. Cook and stir till thickened and bubbly. Add shredded American cheese; stir until melted. Stir in cooked spaghetti and cubed chicken and thawed peas. Turn into a 2 1/2 quart casserole. Top with Parmesan cheese and bake at 350 degrees for 45 minutes.